Train lik e the experts with the IRA Training Organizer™. This toolkit includes everything you need to deliver customized, basic IRA training. You’ll get instructions, training tips, activities, tests, a PowerPoint® presentation, and more. 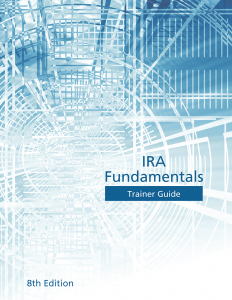 Each IRA Training Organizer includes (1) Trainer Guide, (1) Trainer CD, (1) Presentation Notes, and (1) Student Guide. Purchase additional Student Guides for your staff in the store. Already have the IRA Training Organizer? Keep it current with our IRA Training Organizer for past purchasers—updated annually for legislative changes and COLAs.